I love this finished notebook. I got this plain kraft brown and red cloth notebook from our local discount store. All it said on the front cover was “notes”. I liked that it included a pen and had an elastic closure, but other than that, it was very boring. So I had to dress it up and strawberries have been on my mind lately. Indiana is winding up its strawberry season. So my family has had them at practically every meal… on waffles in the morning, in smoothies at lunch time and strawberry shortcake for dessert. First of all, I love strawberries. They are my favorite fruit. I have the fondest childhood memories of picking and eating them from my great aunt, Audrey’s wild strawberry patch. I still haven’t been able to find berries that taste as good as hers did. I’ll just have to keep looking. 🙂 Secondly, this stamp is from the retired Stampin’ Up! set Nature’s Sketchbook. It is one of my all time favorite sets. So the read cloth on this notebook reminded me of red strawberries. I colored the berries with colored pencils, distressed the edges and mounted it to black cardstock. Then I adhered it all to the plain, store bought notebook. Hence, that is how this notebook came into creation. It will be at the Walmart craft show this Saturday in Brownsburg, IN if you’d like to see it. Remember… if you mention my website you’ll receive a free gift. 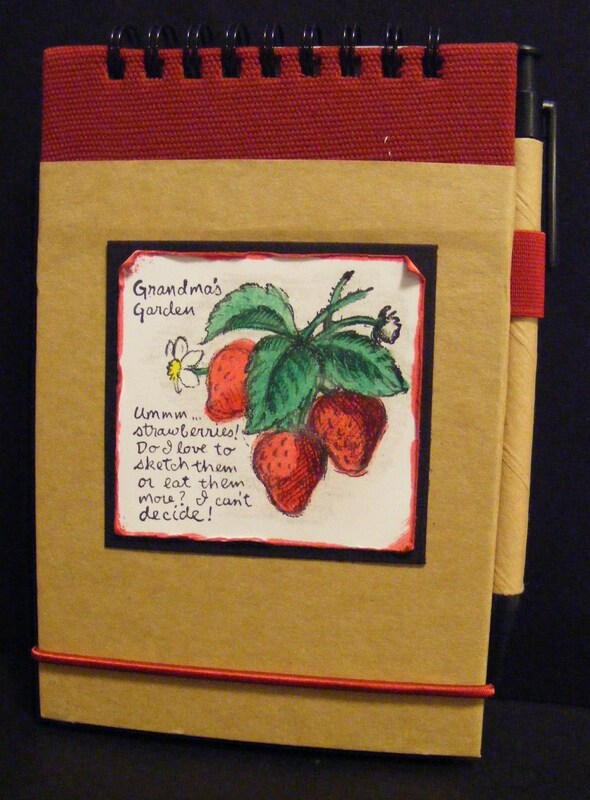 This entry was posted in Notebooks & Journals & Diaries and tagged notebook, Rubber Stamps, Stamping, strawberries. Bookmark the permalink.